Stories of Justice – featuring the legacy of Martin Luther King, Jr. 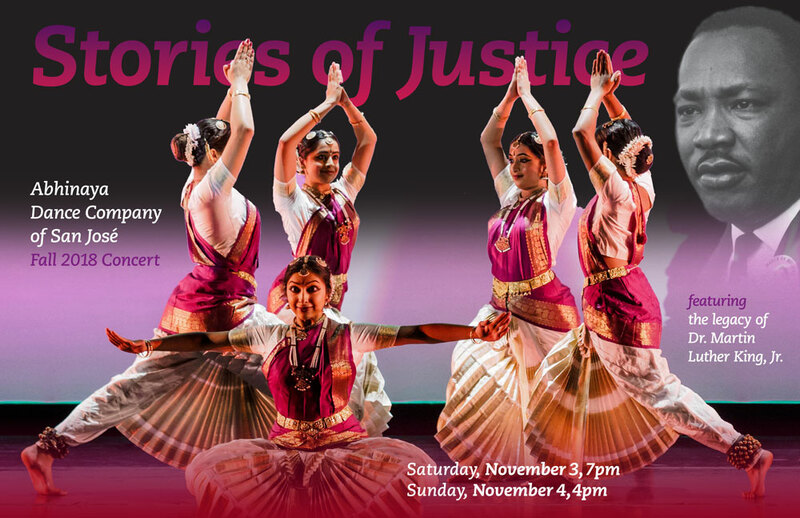 Stories of Justice, directed by Artistic Director, Mythili Kumar, features Abhinaya Dance Company members including Rasika Kumar and 9 others. This original evening-length concert comprises a half a dozen 10-minute dance pieces and explores historical and contemporary stories of resistance, social justice and resilience. Abhinaya will tell these stories by employing the stylistic vocabulary of Bharatanatyam, a dance form that originated in the Hindu temples of India over 2000 years ago. The dance will be accompanied by a live orchestra consisting of vocalists, violinist, saxophonist, cymbals, mridangam, and tabla percussionists. Stories of Justice will examine the non-violent resistance strategies of Martin Luther King, Jr. to demonstrate that the fight for social justice is ongoing and that past struggles provide lessons that enable us to confront our current problems. Dance pieces will highlight struggles ranging from the Bible’s King Solomon (the judgment between two mothers over a baby) to Tamil Literature’s Kovalan and Kannagi (the unjust killing of Kovalan and the burning of the city of Madurai by Kannagi), concluding with the legacy of Dr. Martin Luther King Jr. Rasika Kumar, dancer and choreographer, will present a solo on Rosa Parks’ courage in defying bus segregation in the South. This act spurred Dr. Martin Luther King Jr. to begin his first civil resistance movement – the boycott of buses in Montgomery. Abhinaya dancers will dramatically portray this and other key protests in his life, where he emphasized the principle of non-violence deriving inspiration from Mahatma Gandhi’s struggles in India. Dr. Martin Luther King’s messages on non-violence and love resonate across the conflicts arising from several recent events of injustice such as the killing of black motorist Philando Castile, the arrest of two black patrons at Starbucks, and the upsurge in the Ku Klux Klan and alt-right marches.